TeamOz "Worldwide Manufacturers TinTop Challenge"
Championship Concept - Race through the ages from 1965 to 2009 in vehicles arounds tracks that match that era. Look forward to having some of the JFF guys like Greens and Jade back for this series... It's open to EVERYONE!! 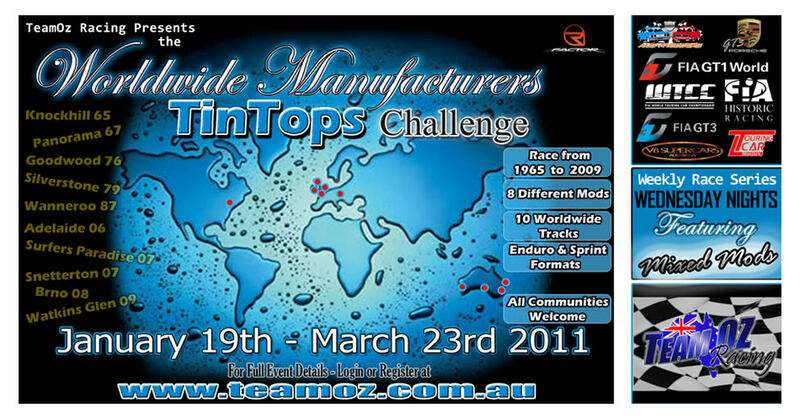 Re: TeamOz "Worldwide Manufacturers TinTop Challenge"
i'll try and make to it the 2nd and 23rd of feb and the 23rd march meetings... or do you have to drive them all??? JFF_VTIMMY wrote: i'l... or do you have to drive them all?? ?